New Delhi:25/12/18: Jindal Steel and Power Ltd (JSPL) has been conferred with the fifth CSR Impact Award in the environment category for its natural resource management initiatives under its CSR programme. Union Minister of State for Skill Development and Entrepreneurship Anant Kumar Hegde presented the award to JSPL’s Group Head (CSR and Education), Prashant Kumar Hota. 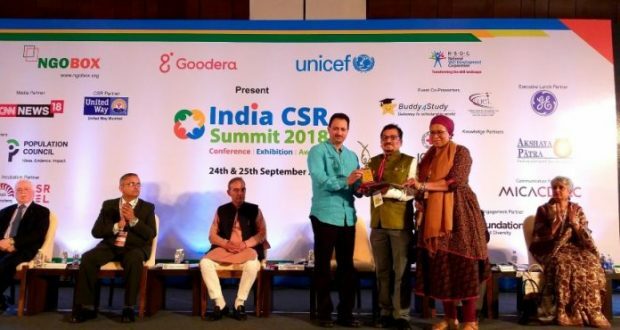 The CSR award for environment was delivered to JSPL in the presence of Union Minister of State for Human Resource Development, Water Resources Development and Ganga Rejuvenation Dr Satya Pal Singh during the India CSR Summit 2018 organised by leading front line organization, the NGOBOX at New Delhi on Monday. Director of OP Jindal Community College, Miriam Carter was present along with Prashant Kumar Hota to receive the award. Thanking jury members for the award, she added that the award would encourage JSPL Foundation to explore replicating similar programmes in other deserving locations. JSPL has been awarded for the implementation of Integrated Watershed Development and WADI programmes in Odisha and Chhattisgarh in partnership with NABARD. The winner of the fifth CSR Impact Awards was selected after a two-stage evaluation concluding with the jury round. Recently, JSPL also won the India CSR Award for the Decade for social investment in Chhattisgarh. JSPL Foundation had also won the Odisha CSR Forum Award for sustainable development projects.